Heroic might now does a max of 450! If those are the only changes they actually made he''ll actually be fixed. gratz on fixing this in a reasonable time frame. Blaster heroes will still take a bigger hit but with the radius reduced it shouldn't be as bad. Wouldn't say he can one shot them but if they are in the radius they will be in trouble with his follow ups. And again your ok with that? Absolutely. Not just cause he's my favorite hero either, it's because so many heros have crippling abilities. Kylo's freeze will still melt you, getting caught by vaders choke is a death sentence in GA, & bossk can take 400 plus health from you without being any where near you. I think this was the perfect nerf, he didn’t get nerfed to death TG! I hope this will be his last nerf he’s pretty balanced now. It is the unannounced changes we always find that worry me. I have no problem with heroic might. As a Han player I have only been killed by it a few times. Once he goes into the animation you just need to roll back (or block). 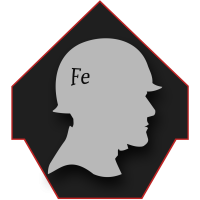 He telegraphs this move, giving plenty of time to prepare. I have more of an issue with his pull and then getting hit with a passionate strike. That is almost a guaranteed death. 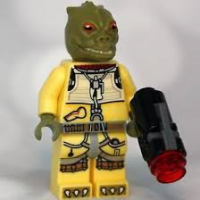 Did you mean "as a blaster hero player"? Because Anakin and Han are on the same side. yes, my bad. I am playing Han so much. 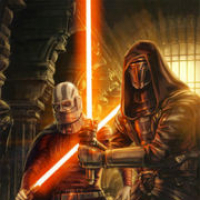 I do play light saber villains a lot, but it is very easy to protect yourself from the heroic might just by blocking. These past few nights I have been trying Boosk and was able to retreat in enough time to avoid being hit. Yes, thanks for the correction. I picked a bad day to stop sniffing glue. Very nice balance changes for now. He might need some additional tuning, but that can wait until the big March update later this month. Well I like they are going step by step with nerfs, I was the first saying he needed to be nerfed but I don't want him on the ground, so let's see how he does with this tweak. At least now I won't get oneshotted in GA while palpating around because of that skill. Well it still leaves me at 200 health or so but at least I don't instadie(I'm don't even attack him but ofc another 10 people does). Obi-wan goes back to being trash now, as bad as that bug was it kinda highlighted to me just what was wrong with him. 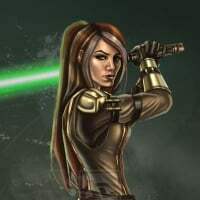 No more anakin nerfs from here on out. 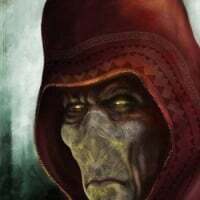 I cannot wait until new threads gets posted asking to nerf the WHOLE Darkside because " Now Lightside is weak again". Indeed. It was fun wrecking entire teams for a week, but this was pretty much inevitable. No further nerfs though. I want his saber damage, HP, Passionate Strike, etc. to stay where they're at so he can continue to dominate in saber fighting, as he should. It's Anakin. Isn't there a star card that extends the range for heroic might? Useless now? I think I have a blue card for that, but maybe I'm wrong. 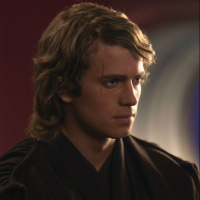 Why should Anakin dominate in saber duels, he had 3 in the films and lost 2 of them. Ok, thanks. 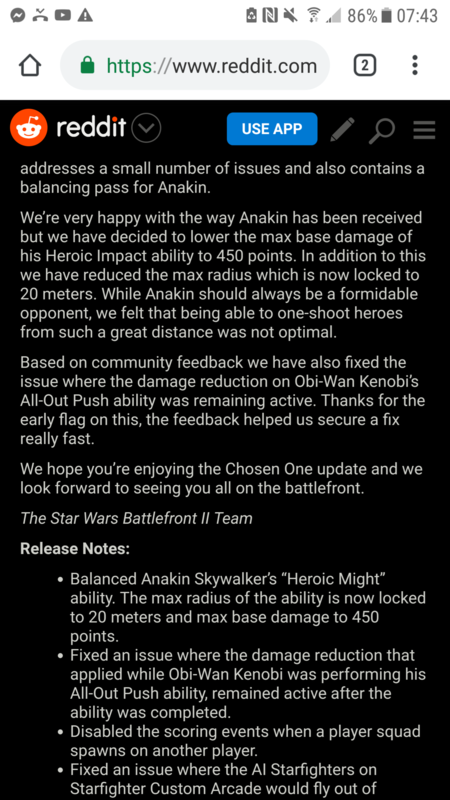 So the base range is less than the 20 meters they are talking about being the max, got it. 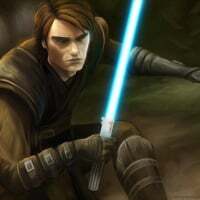 BF2 Anakin is based on Anakin from ROTS and the Clone Wars--not AOTC, where he was still an inexperienced kid. Anakin beat Dooku single-handedly. No other Jedi could do that--not even Yoda. Obi-Wan didn't "beat" Anakin. He let Vader destroy himself through a tactical mistake made out of arrogance. He even told Vader what was about to happen, and Vader jumped anyway, proving that it was Vader's pride that caused his loss. It's SW canon that Anakin was the most powerful Jedi. 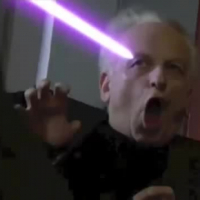 Palpatine can do that too. True but anakin doesn't have to worry about another hero that can cause him to die in 2 seconds. 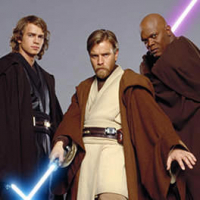 Well in the ROTS that I saw, Obi-Wan got knocked out, leaving Anakin to take on Dooku alone. 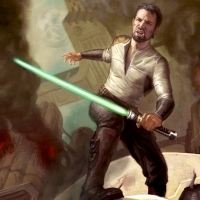 He chopped off Dooku's hands and beheaded him. 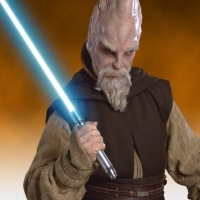 Yoda couldn't beat Dooku--it ended in a stalement with Dooku running for the door. (Plus I'm literally right that Anakin single-handedly beat Dooku). Wrong. Yoda didn’t beat Dooku because he ran away. Meh, the duel was a draw, neither had the upper hand. If anything, Dooku won because his goal was just to escape from the start. The duel was a draw in the sense that nobody was defeated. Dooku’s goal was to escape...because he knew he was no match for Yoda & didn’t have a realistic chance of actually killing him. Hence why he distracted him by attempting to drop the thing on Anakin or Kenobi. 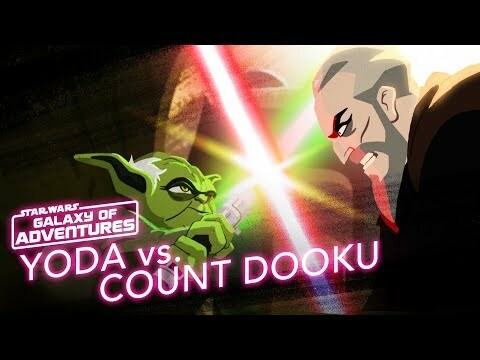 If the duel had played out to its entirety, Yoda would have defeated Dooku. How big is the update? How come we didn't know about it? I had been quitting as DS in GA because it was pointless getting a hero and suffering sudden death. They announced it this morning.